Take a photo tour of pristine Amelia Island, Florida. 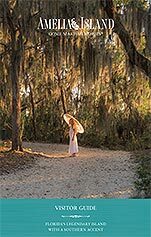 A Southern jewel in the Sea Island chain of barrier islands, Amelia Island has 13 miles of pristine, uncrowded Atlantic beaches framed by natural beauty. Stroll, swim, or just take it in. More than 90 distinctive restaurants featuring fresh local seafood and produce, authentic international specialties, bistros, fine dining to casual outdoor spots are waiting for you. Events all year, from the the Shrimp Festival and the Concours d’Elegance, to festivals celebrating Jazz, Chamber Music, and Books, Pétanque America Open and holiday celebrations. 99 holes of stunning, world-class golf await. From undulating greens, marsh front holes and oak-lined fairways, the links of Amelia Island offer irresistible play for golfers of every skill level. Cruise into the sunset (as a passenger or a captain,) cast a line, kayak through the marshes or hop on a surfboard or paddleboard and explore the ocean. Florida's first luxury tourist destination has hosted a host of colorful characters from fabled pirates to Gilded Age millionaires. Discover Fernandina Beach's 50-block downtown historic district. Experience the lush landscape of the maritime forest, marshlands, and beaches. Ride a bike trail or hike through one of the preserved areas that surround the island. From top-end resorts to unique historic hideaways, the comforts of your favorite hotel, a cozy beachfront condominium or villa or a campsite under the stars, there is something perfect for your family and your style.